With former Gov. John Engler out as interim president at Michigan State University, trustees say the university can finally begin healing from the scandal and emotional trauma left by years of hidden sexual abuse from former MSU gymnastics Dr. Larry Nassar. The board voted unanimously on Thursday morning to accept Engler’s resignation immediately and replace him with longtime MSU administrator Satish Udpa. Board members who voted to oust him originally voted to bring him in as interim president less than a year ago, starting on Feb. 5, 2018. He replaced Lou Anna Simon, who stepped down in the midst of the Nassar scandal, and has since been charged with four counts of lying to a peace officer. Some in the Legislature expressed interest in going after MSU’s state funding in light of its slow handling of the crisis. Engler, a GOP three-term governor, was seen by Democrats and Republicans alike on the board as someone who could work well with a Republican-controlled Legislature and keep the university’s funding intact. 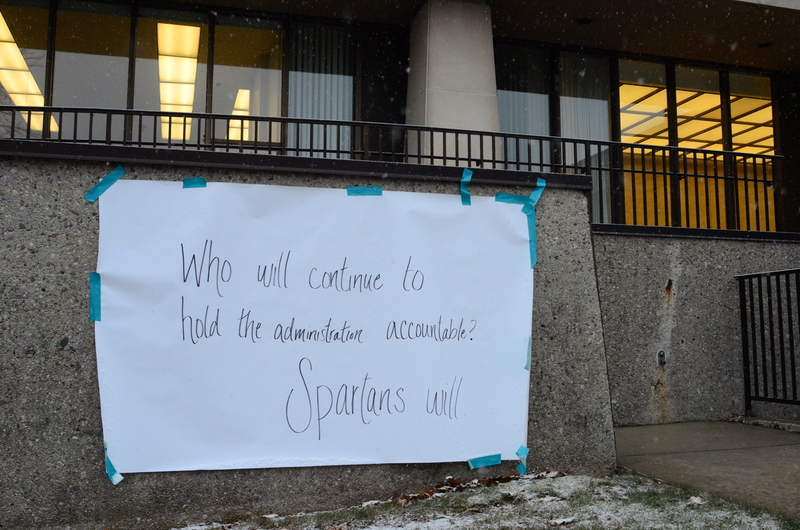 But MSU Board of Trustee Chair Dianne Byrum said on Thursday that one of the primary reasons why the board chose Engler was because of his reputation as a “decisive” leader. At that time, college administrators had not finalized a $500 million global settlement with the hundreds who survived Nassar’s sexual abuse. While trustees excoriated Engler before tendering his immediate resignation on Thursday morning — with Trustee Brian Mosallam going so far as to say, “Engler’s reign of terror is over” — Byrum acknowledged that Engler accomplished one of the primary goals he was tasked with. But a comment Engler made last week suggesting that some who survived Nassar were “enjoying” the spotlight, as the Detroit News first reported, was simply too damaging to ignore, Byrum said. Engler’s comments were so “ill-advised, insensitive, hurtful and harmful” that she asked the former Republican governor to resign early Wednesday morning, after originally charging him with leading MSU through the storm left in Nassar’s wake. Engler also decided to close a $10 million victims assistance fund to help survivors of Nassar’s abuse after nearly $1.2 million went to people trying to defraud the university, Engler told the Lansing State Journal in October 2018. But the decision to shutter the fund was slammed by survivors, Democrats — including Gov. Gretchen Whitmer — and MSU trustees, who opened a new fund after the outcry. Although in his 11-page resignation letter, Engler suggested that new Democrats elected to the board this year were responsible for his ouster, the Republican vice chair, Dan Kelly, said partisanship had nothing to do with it. Melanie Foster, a Republican and Engler supporter on the board, was absent from the meeting. Byrum and Mosallam said the decision to replace Engler resulted from his own comments. “Well, [Trustee] Joel Ferguson’s a Democrat, and he was his No. 1 supporter and ally, first of all. Second of all, Nancy Schlichting is a Republican appointee,” Mosallam said, referring to GOP former Gov. Rick Snyder, who tapped her in December. “And third of all, compassion, empathy, tone and treating people with respect and dignity is a bipartisan issue. So I’m not sure where he got that from,” Mosallam added. Now Udpa, who was previously a top administrator for the university, will take the reins from Engler. Udpa aims to create a campus environment that makes survivors “whole,” he said, making it clear he does not intend to be the university’s permanent leader. Udpa was, until this morning, MSU’s executive vice president for administrative services and a distinguished professor. He will now work to change campus culture to reflect a sense that administrators respect students and ensure that people are “treated fairly, humanely,” he said. Meanwhile, the search for a full-time president will not last long, according to Byrum. The university is already considering a “robust pool” and the board of trustees may select a new, permanent president as soon as June, she said. She thanked Udpa for accepting the new role at a university that has been struggling to move past the Nassar scandal and prior issues with campus sexual assault.